Liu Haichan was a high official during the tumultuous Five Dynasties era, a time of bloodshed and civil war at the beginning of the tenth century in China. He served the powerful warlord Liu Shouguang, who in 911 proclaimed himself emperor. Liu Haichan became the new emperor’s grand councilor–one of the most powerful positions in China. Shortly thereafter, a famous Taoist wizard visited Liu Haichan to discuss the mysteries of the Tao with the councilor. At the end of the meeting, the wizard requested ten eggs and ten coins which he adroitly stacked into a teetering pagoda on the grand councilor’s desk. “This is precarious indeed!” exclaimed Liu Haichan. “It is not as precarious as your current life” stated the wizard who snatched the ten coins from the pagoda and vanished, leaving a ruin of smashed eggs on the polished wood. The interview caused Liu Haichan to carefully re-examine his situation. The next day he abandoned the wealth and power of his position and fled to a wooded mountaintop to live as a hermit. Since the new emperor was soon captured by an opposing army and executed, this proved to be a wise choice. Like Zhang Guo Lao before him, Liu Haichan devoted himself to a life of alchemy, sorcery, and potions in the wilderness. He became strong in Taoist magic, and rose to head the Quanzhen school of Taoism. 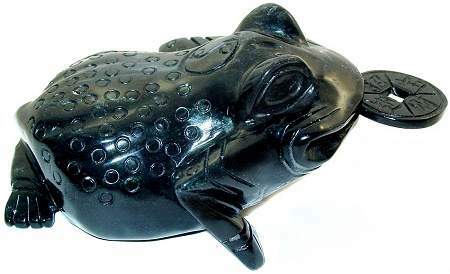 In the fullness of time he took the name Haichanzi (Master Sea Toad) and apotheosized to immortality. 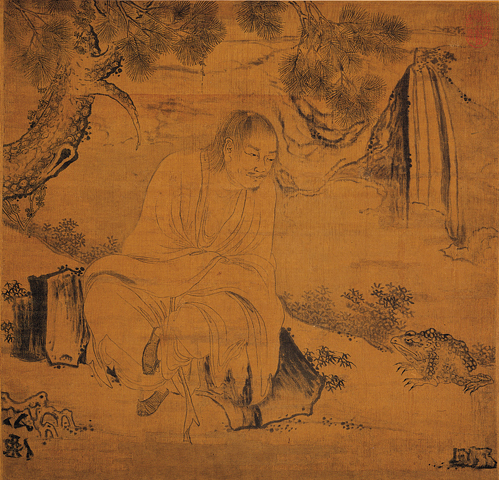 Liu Haichan gained his distinctive sobriquet because he is usually pictured with a three-legged toad, Chan Chu, who today has outstripped the Taoist master in fame. 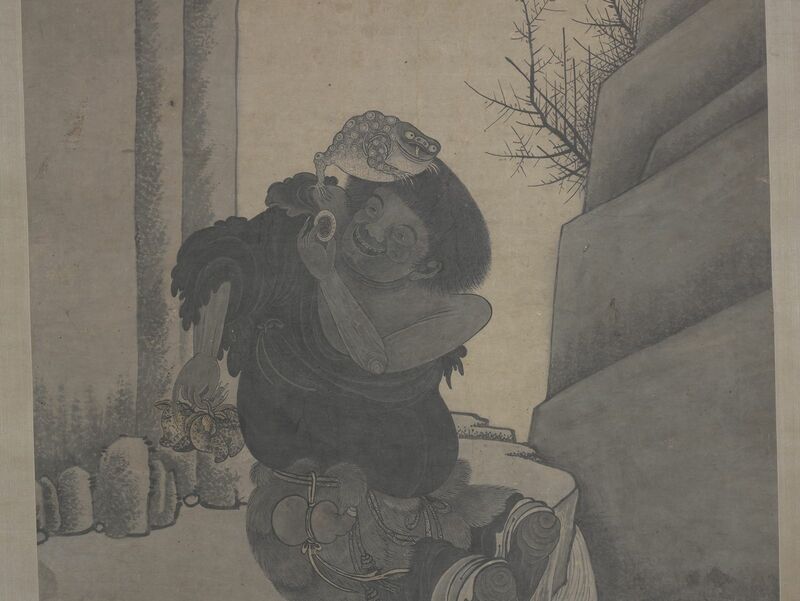 Stories concerning this toad differ, but my favorite is that the toad was the reincarnated spirit of Liu Haichan’s father, a greedy petty official whose human life was spent squeezing peasants for money. One day Liu Haichan peered into a ruined well and saw the toad’s red eyes glowing in the filthy darkness. Recognizing something familiar about the creature, Liu Haichan dangled a string of money down the well. The greed of his previous life could not be left behind and the toad grabbed the coins with his mouth. Liu Haichan drew Chan Chu up from the slime and thereafter the two became inseparable. Liu Hainchan was a popular subject for Ming and Ching era literati painters but Chan Chu, the three legged wealth toad, went on to find international success. The avaricious amphibian admirably suits today’s zeitgeist. 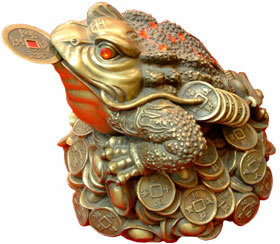 Statues of the wealth toad can be found in businesses around the world. Usually Chan Chu is portrayed holding a coin in his mouth sitting on a pile of gold coins. Sometimes he is covered with jewels. You could probably buy a resin Chan Chu statue at your nearest Chinatown or online. If you choose to do so, Feng Shui enthusiasts advise you to place the statue near the cash register facing away from the door so that money comes in but does not leave. Never put a wealth toad statue in the bathroom: Chan Chu regards moist enclosed spaces with little fondness after his time in the well. Great story…I’m surprised that this greedy frog is now seen as a positive symbol. Also, I wonder about the significant of the missing leg. The west also has its own grasping amphibian archetype (although ours is a social climber frog who wants to be a prince rather than a money grubbing toad). Maybe this is some sort of universal comic archetype. I wondered about the toad’s three leggedness too but I didn’t come across any explanations…If I find anything out, I’ll post it here.